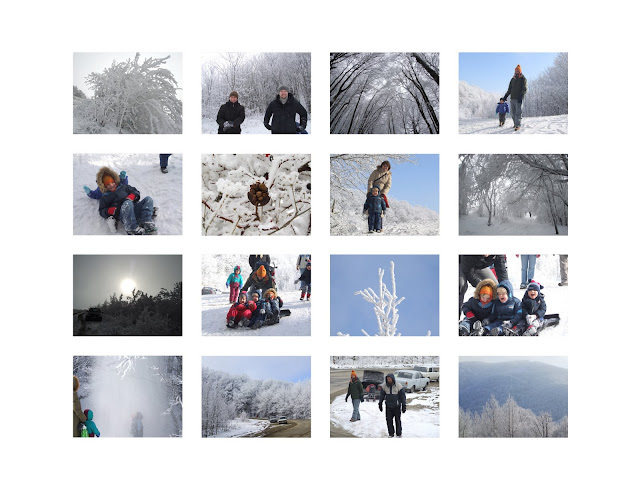 Today we went with Ilya and Ira and their kids up to the mountains to play in the snow. We had very little time to get ready; Ilya had been trying to get ahold of us for awhile and they were all ready to go when he called. So we rushed around, destroying the house in the process, trying to find long underwear and hats and gloves and snowboarding pants. Finally we were all bundled up, and we went outside to wait for the car. Once again, we piled in like a bunch of illegal immigrants and made our way through the city. It was so cool to get out of the main city area. All of Novorossysk is wrapped around the harbor like a horseshoe, and the sides are surrounded by mountains. Once we got onto the mountain road it was like being in another country. There is no snow in the city, and then suddenly we were in a winter wonderland. Not like California where you can drive up to the mountains on the weekend and see some patches of snow—every tree was encrusted with white like something out of a fairy tale. Of course I forgot my camera and I was kicking myself over it. We pulled up to a little turnout where Lyosha and Anya were waiting along with another family from church and we piled out. At first Ilya was a little nervous about the snow, after his traumatic experience in St. Pete, but when Ilya (the adult one) pulled the plastic thing that keeps the trunk of his car clean out for the kids to sled on he cheered right up. They had also brought their snow skate (looks like a slightly larger version of a skate deck, geared for snow) and we all took turns going on it. That was pretty fun. Really intensified my desire to go snowboarding. But despite the fact that I have the gear, I can’t imagine that I’ll actually get to go. I am a snowboarding pessimist. Anyway, it was fun, but COLD. My feet were numb despite the snow boots I was wearing, and my worthless gloves did nothing to get my hands warm. It was hours before I could feel my toes again. We left because all the little ones were turning blue, and we went with the Gromovs to a little café restaurant in the city to eat and warm up. Something about the cold makes me ravenous, seriously. I don’t even think I tasted my food I ate it so fast. Finally we got home, and took off our multiple layers of clothing. It’s so nice to be able to go out, have fun, then come home and put on the pj’s. It’s so nice to have a life! You mean Southern California. There were plenty of times in NoCal that I have driven into the mountains and experienced a blizzard. In fact, there is too much snow up there for me. We're actually having a good winter here in SoCal for snow, so we may take the kids up the mountain sometime.